GHOST is based in Waldsassen in Germany and was founded in 1993. From the very beginning, Uwe Kalliwoda and Klaus Möhwald wanted to build mountain bikes that were fun to ride and better than the rest. Their first three models were all full suspension bikes. Hardtails, trekking bicycles and children's bicycles all followed later. In order to offer the highest levels of quality and customer service, the company constantly develops its bikes and prides itself on introducing innovations to the bike world. Ghost bikes are extremely durable and reliable bikes that push the boundaries of technology and development, while ensuring the highest level of quality and commitment to customer service is maintained. Philosophy, passion and enthusiasm are the three characteristics that are incorporated into the development of each bike. 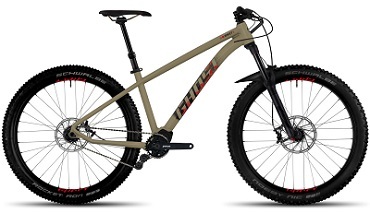 Ghost’s focus on producing mountain and trekking bikes has more recently shifted and the company now produces a range of hybrid and city bikes as well as a selection of children’s bikes to suit different ages and levels. Bikester.co.uk stocks a comprehensive range of Ghost bikes, including full suspension, hardtail, hybrid and city bikes suitable for varying ages and levels. Ghost is a German company that was founded more than 20 years ago by Uwe Kalliwoda and Klaus Möhwald in Waldsassen in northern Bavaria. Combining a near obsessive passion for cycling with a vision of manufacturing high-quality and reliable bikes that support the needs of cyclists at all levels, the range covers mountain bikes, hybrid bikes, city bikes, trekking bikes and road bikes. Ghost is also a committed benefactor to some of the world’s best MTB teams and riders. While it has offices across the globe, the bulk of its production remains in Germany, with 70% of its bikes manufactured in Waldsassen. The first bike that Ghost manufactured was the LECTOR, a lightweight hardtail MTB that was inspired by the “hungry” main character from Silence of the Lambs, Hannibal Lecter. In this case, they designed a bike so “hungry for victory” that it literally eats up kilometres and mountain ascents. The Ghost LECTOR was so popular it became the foundation of their success, and now all of their top products feature the LECTOR stamp. The latest versions of the LECTOR are made from carbon and titanium. Extremely lightweight and stiff, it is direct and nimble and aggressive on challenging terrain, which allows for precise handling. A popular model among mountain bikers is the Ghost Katos, an ultra-light and stiff aluminium Hardtail for those who want a superior riding experience without splurging on a carbon bike. The mountain bike model Ghost Miss Touring is ideal for beginners to mountain biking and is also suitable for use in cities. For children starting out, the Ghost Powerkid model is both lightweight and suitable for a number of different terrains, perfect for fun family outings.